Little is known about who issued them, since most were just small traders and people like them usually don’t get a mention in history. Where possible, I have added scraps of information gleaned from local histories and local archaeological societies. These notes appear as purple-coloured italic text. In the 17th century, Dublin was a walled city with a series of gates to protect it from raiders via sea and land. Most of the suburbs we know today simply didn’t exist. The areas outside the city walls were known as the Liberties and the bylaws of the City Dublin did not apply there. Outside of the city was the defensive zone known as the Pale of Dublin and, outside of that, was a ‘contested’ zone known as The Marches. By the 1650’s Ireland lay in ruins – 25% of the population were dead due to the rebellion, the famine that followed and outbreaks of disease such as plague and dysentery. In July 1653, the Commonwealth regime issued an order for the transplantation the following year of Catholic landowners across the Shannon to Connacht, the most isolated and poorest of the four Irish provinces. This order targeted thousands of landowners and their dependants but even the most recent research on the topic has failed to produce accurate figures for the numbers who actually moved into Connacht. Catholics, however, no longer retained any land east of the Shannon. In September 1653, two months after the transplantation order, the English parliament passed the Act of Satisfaction, which began the process of distributing forfeited lands among the adventurers and disbanded soldiers. The death of Oliver Cromwell in September 1658 resulted in the collapse of the English experiment in republican government shortly afterwards. The restoration of Charles II in 1660 raised Catholic Irish expectations of recovering their lost lands but in November of that year the king published ‘a Gracious Declaration’ outlining his plans for Ireland. Charles acknowledged the ‘many difficulties, in providing for, and complying with the several interests and pretences there’, but highlighted the debt he owed to Protestant leaders in Ireland for facilitating the restoration of the monarchy. The declaration effectively established the year 1659 rather than 1641 as the benchmark for all future land claims, consolidating the Cromwellian land settlement in the process and dashing the hopes of Irish Catholics. After 1650, the traders and merchants within the walls of the City of Dublin were exclusively Protestant but it seems like a few native Irish surnames managed to gain a foothold by the 1660’s. Many of these coins are exceeding rare and some are unique, i.e. only one recorded. As such, they rarely come up for sale at auction and images are difficult to obtain. Additional photo’s will be added in due course. One of the great attractions of collecting these trademens’ tokens is that they offer great scope for further research and there is also a very good chance that a new (previously unrecorded) token will be found. They often turn up in attic accumulations and car boot sales where they are amongst the unidentified oddments. 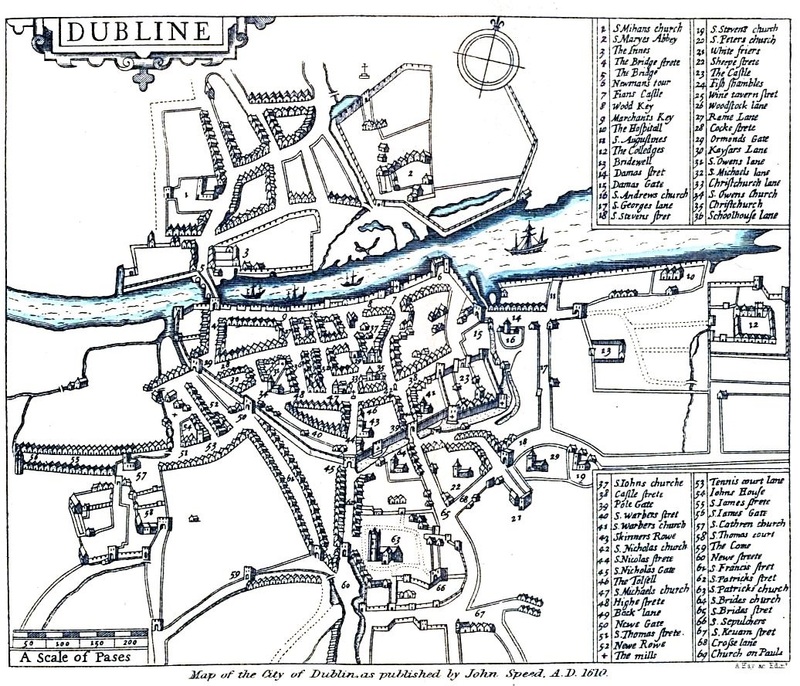 Skinners Row is now known as Christchurch Place and first appears on a map of Dublin in 1367. In 1821, the north side of the street (tenements) was removed and in 1833 the street was widened northwards to give the broad thoroughfare we know today, thence forward known as Christchurch Place. The earliest mention of this place in its Latin form (Vicus pellipariorum) comes via Gilbert in his History of Dublin for the year 1269. Is the V on the obverse legend a misread or an N with a leg missing? Is James Cleere related to Edmond Clere, Merchant, Cooke Street ? Lazey Hill is a derivative of the original name “Lazer’s Hill” – the site of a leprosy hospital outside the walls of medieval Dublin. It treated those returning from the Crusades suffering from leprosy and anyone unfortunate enough to contract the disease locally. It is thought to have occupied a site on the modern day Townsend Street. This is a very unusual coin insofar as it contains an image of St Patrick. The only other tokens to have this this unusual imagery are the enigmatic St Patrick’s Farthings later on in the same century. I wonder if there is a link ??? This is a very unusual coin insofar as it contains a brass plug, designed to make the star look brighter than the dull copper around it. The only other coins/tokens to have this this unusual (and expensive to manufacture) feature are the enigmatic St Patrick’s Halfpennies which may have been minted around about the same time. I wonder if there is a link ??? One of the questions asked of me is whether the St Patrick’s Halfpennies are tokens or coins? Given that about 450 different die varieties have been identified and mintage estimates vary from 1.5 million to 7 million pieces – it would be grossly inaccurate to describe the St Patrick’s Halfpennies as part of the 17th tradesmens’ token series. Obverse: [Unknown] / THOMAS OR . . . .
A street known as Cornmarket still exists today and it first appears on Speed’s Map of Dublin in 1610 (see above). It is also known as High Street. St Patrick’s Close does not appear on a map until 1678 – which is about the latest time this token could have been minted and circulated. This street (Fishamble Street) first appears on a map of 1467 and is shown on Speed’s Map (above). Called Vicus Piscarorium and Vicus Piscariae in ancient documents, it also appears as Fish Street (1470) and Fisher Street (1570). The name dates back to 1410 (Cf Hughes’s St Johns, 15, 120 and Deputy Keeper’s Report, xxiii. 135). Copper Alley still exists today and is situated between Upper Exchange Street and the recently constructed Cow’s Lane – just outside the front gate of Dublin Castle. Originally known as Preston’s Inns, it is so-named after the copper money coined and distributed there in 1608 by Lady Alice Fenton, widow of Sir Geoffrey Fenton (Harris, History of Dublin, p.85 and Gilbert, History of Dublin, i.92). Williamson mis-describes this token as Milltown, Co Dublin. Since then it has been ascribed to Milltown Pass, Co Westmeath. In the 1650s Tallaght would have been a landscape in transition – many Catholic landowners were dispossessed for their part in the Great Rebellion of 1641 and their place was taken by Cromwellian soldiers and officers in payment for their services. Some came to settle, some rented what they didn’t want to farm, whereas others sold their properties to the highest bidders – which usually weren’t the original owners or tenants. The dispossessed were either transported to the West Indies, exiled to Connaught or disappeared into the Wicklow mountains where they, typically, became ‘tories’ – a name given to the various raiders, thieves and criminals from those parts by the citizens of Dublin and the Pale. 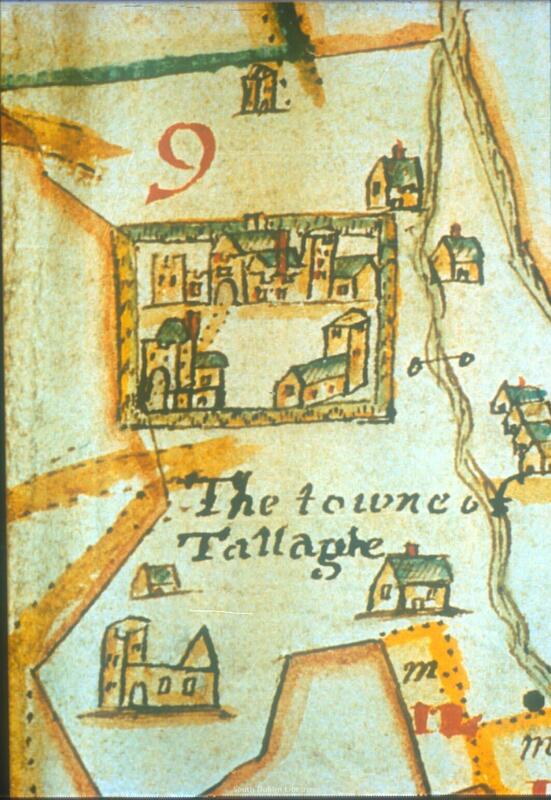 Map of Tallaght c.1641. Tallaght was a fortified village back then and this is why it did not suffer as badly as the surrounding districts during the 1641 Rebellion – a complex conflict of changing sides, mixed motives and varying fortunes for the main protagonists. Andrew Lloyd’s token has links with the nearby City of Dublin which, in turn, had a strategic interest in Tallaght and its surrounding hinterland – given that it relied upon it for its ‘fresh’ water supply. 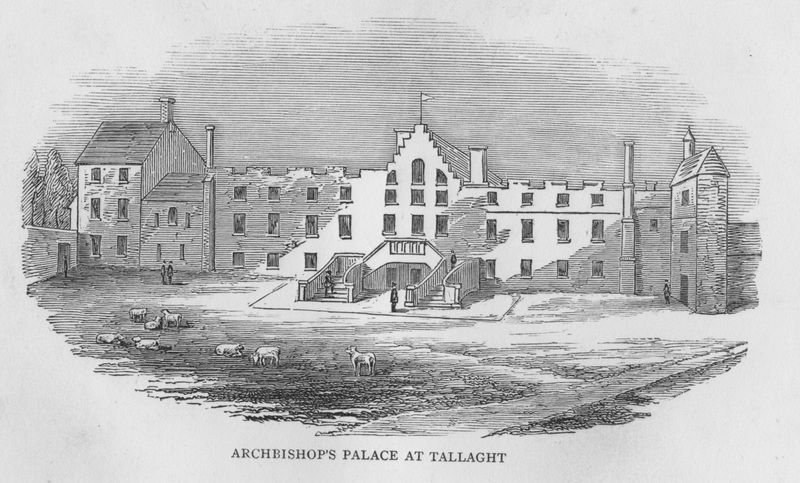 Tallaght was the manorial residence of the Archbishop of Dublin during the 17th C – when Archbishop Hoadley replaced Archbishop King in 1729 he found the castle in ruins, and had it demolished, building himself a palace at a cost of £2,500 (a huge sum in those days). By 1821 the palace too had fallen into ruin and an Act of Parliament was passed which stated that it was unfit for habitation. In 1822, the ruin and its surrounding lands were sold to Major Palmer, Inspector General of Prisons, who pulled the palace down and used the materials to build his mansion, Tallaght House, as well as a schoolhouse and several cottages. Nearby Old Bawn house was built in 1635 by Archdeacon William Bulkeley, son of Launcelot Bulkeley the Archbishop. It was almost unique in architectural style, being one of the first Irish houses that was not built purely for defence. Oldbawn had extensive pleasure gardens that survived, albeit in a neglected state, until 1900. Old Bawn House was damaged in the rebellion of 1641 but was restored immediately at a cost of £3,000. The house was designed in a H shape with high pointed gables and had many windows and twelve chimneys which was unusual at that time. It had many interesting internal features such as the chimney piece and a carved oak staircase both of which are in the National Museum of Ireland in Kildare Street, Dublin. The chimney piece reached to the ceiling and apparantly depicted the building of the walls of Jerusalem, it was dated 1635. I’d be pleased to help (if I can).